Ground Hog offers a large range of augers and accessories for our earthdrills to cover all types of soil conditions and customer requirements. We have augers in three different styles available from 2″ to 12″ in diameter for our C-71-5 Two-Man, 1M5C One-Man and HD99 Hydraulic earthdr. Ground Hog offers a large range of augers and accessories for our earthdrills to cover all types of soil conditions and customer requirements. We have augers in three different styles available from 2″ to 12″ in diameter for our C-71-5 Two-Man, 1M5C One-Man and HD99 Hydraulic earthdrills as well as 14″, 16″ and 18″ Pengo style nursery/planting augers for use with the HD99. At Ground Hog, we are leading the industry to a standard auger drive with our 7/8” square drive that we have been using for over 40 years. All of our earthdrills and augers use this style of drive and are interchangable. We also offer a variety of different auger adapters to use other brands of augers on our equipment as well as our augers on other brands of equipment. We can also build custom augers to meet specific requirements so contact us if there is something special you are looking for. Our augers are manufactured using high quality, heavy-gauge, welded steel construction which results in an auger that is durable and therefore profitable. Standard (SD) Series augers feature hardfaced, screw-in fishtail pilots and bolt-on hardfaced blades. The wide, flat side blades on the SD Series augers are ideally suited for digging in loose or sandy soil. Pengo (PSD) Series augers feature heat treated cast alloy steel boring heads with hardened forged steel side blades and a bolt-on cast alloy steel center pilot bit. 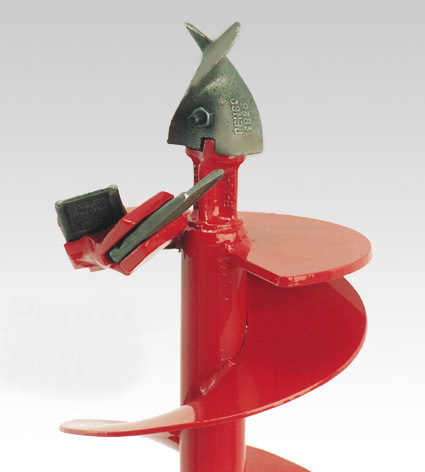 The Pengo Series augers are general purpose augers and are the best choice for tough soil conditions. Combo (CSD) Series augers use a combination of the alloy steel boring heads and hardened forged steel side blades found on the Pengo Series with the screw-in fishtail center pilots found on the Standard series augers. This combination produces a general purpose auger that is an economical alternative to the Pengo Series. All augers are approximately 38” in length, and we offer extension shafts in 1, 2, and 3 foot lengths. A variety of different style carbide-tipped side blades are available for Pengo and Combo augers, as well as full carbide and carbide-tipped center pilots for Pengo Series augers allowing you to custom tailor your auger to your specific needs and soil conditions.